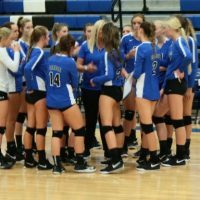 The Carbon Lady Dinos easily defeated the American Leadership Academy Eagles with a straight set victory in their third Region 14 contest of the season Tuesday night at Carbon High School. Looking to respond from a loss last week against the Juab Wasps, the Lady Dinos were dominate throughout the night. Setting the tone with a 25-12 win in the first set, Carbon took full control with a 25-10 win in the second set. Carbon then ended the match with a 25-14 win the final set. Now 2-1 in Region 14 play the Lady Dinos are in sole possession of third place. Trailing Juab by just a half game, Carbon sits just one back of first place Delta. Carbon will return to the court Thursday night for another Region 14 showdown, this time against the Union Cougars in Roosevelt. The next home game will take place Tuesday, Sept. 18 against Delta.